It’s pretty difficult to hold a multitude of passwords in mind, isn’t it? A pin code for your mobile, a password for your mailbox, a pin code for your credit card, a password for your MSN Messenger – we have to remember a variety of different passwords. AnyPassword is a handy software tool to sort out this problem. Now, you can store all your passwords in one secure place, which is protected with a special encryption algorithm. Your mess and anxiety about passwords are over – AnyPassword will give them only to you at your first wish. 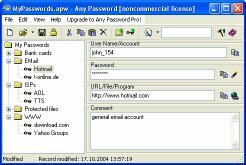 AnyPassword stores all information in a tree form, which allows you to make subfolders and group all your passwords according to themes. Aside from the password itself, your record can contain a link to any file or program. Besides, you are able to add your comments on the current password right to your password record. In addition to this, the program provides for various criteria for quick search of password records. This saves your time dramatically: within seconds you get the password you need. AnyPassword protects your private information with strong algorithms, which reduce the possibility of unauthorized access to the minimum. You can set a password for your database file, so that this will be the only password you need to remember. Besides, a smart password generator is ready to give you a random password, which is impossible to guess. You can participate in the password generating procedure and specify the length of this secret word and the type of characters to be used. AnyPassword has a simple intuitive interface, which supports not only English, but many other languages, including Czech, Danish, Dutch, French, German, Greek, Hungarian, Italian, Lithuanian, Norwegian, Polish, Romanian, Russian, Slovak, Spanish and others.